BRIDGEWATER, N.J., Oct. 30, 2015 /PRNewswire/ -- Sanofi US is voluntarily recalling all Auvi-Q® (epinephrine injection, USP). The recall involves all Auvi-Q currently on the market and includes both the 0.15 mg and 0.3 mg strengths for hospitals, retailers and consumers. This includes lot numbers 2081278 through 3037230, which expire October 2015 through December 2016. The products have been found to potentially have inaccurate dosage delivery, which may include failure to deliver drug. If a patient experiencing a serious allergic reaction (i.e., anaphylaxis) did not receive the intended dose, there could be significant health consequences, including death because anaphylaxis is a potentially life-threatening condition. As of October 26, 2015, Sanofi has received 26 reports of suspected device malfunctions in the US and Canada. None of these device malfunction reports have been confirmed. In these reports, patients have described symptoms of the underlying hypersensitivity reaction. No fatal outcomes have been reported among these cases. 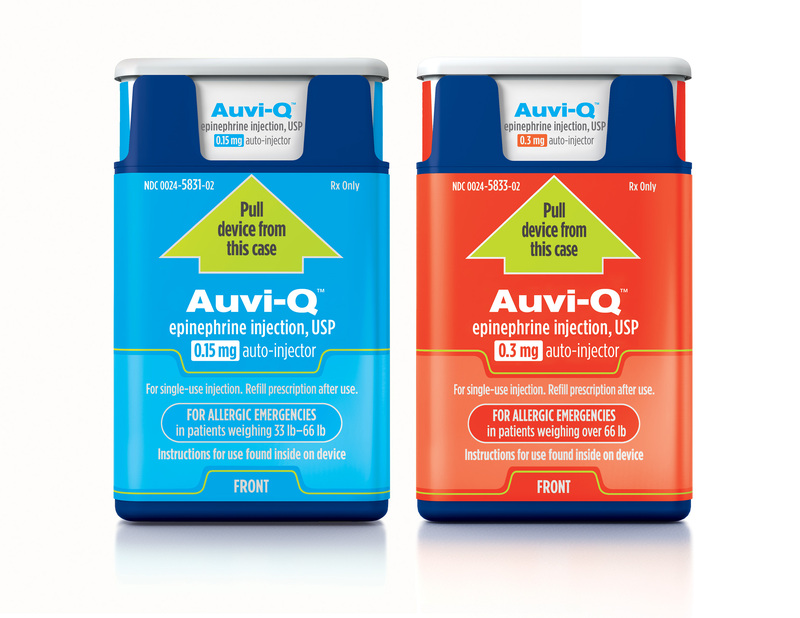 Auvi-Q (epinephrine injection, USP) is used to treat life-threatening allergic reactions (anaphylaxis) in people who are at risk for or have a history of these reactions. Auvi-Q is packaged with two active devices and one trainer device in a corrugate box. Auvi-Q was distributed throughout the United States via wholesalers, pharmacies and hospitals. All Auvi-Q is being recalled. Sanofi US is notifying its distributors and customers who include doctors, pharmacies, wholesalers and other customers in the supply chain by letter, fax, email and phone calls and is arranging for return and reimbursement of all recalled products. Customers with questions regarding this recall can go to www.Auvi-Q.com and call 1-877-319-8963 or 1-866-726-6340 Monday through Friday 8 a.m. to 8 p.m. ET for information about how to return their Auvi-Q devices. Customers may also email cs@sanofi.com. Sanofi US will provide reimbursement for out of pocket costs incurred for the purchase of new epinephrine auto-injectors with proof of purchase. In addition, if you purchased Auvi-Q at a cost that exceeds the cost of your replacement device, Sanofi will compensate you for the difference, with proof of original and replacement product purchases. Sanofi US is committed to patient safety and the quality of Auvi-Q, and will continue to work closely with customers and regulatory authorities to resolve this issue in a timely manner. Auvi-Q is for immediate self (or caregiver) administration and does not take the place of emergency medical care. Seek immediate medical treatment after use. Each Auvi-Q contains a single dose of epinephrine. Auvi-Q should only be injected into your outer thigh. DO NOT INJECT INTO BUTTOCK OR INTRAVENOUSLY. If you accidentally inject Auvi-Q into any other part of your body, seek immediate medical treatment. Epinephrine should be used with caution if you have heart disease or are taking certain medicines that can cause heart-related (cardiac) symptoms. If you take certain medicines, you may develop serious life-threatening side effects from epinephrine. Be sure to tell your doctor about all the medicines you take, especially medicines for asthma. Side effects may be increased in patients with certain medical conditions, or who take certain medicines. These include asthma, allergies, depression, thyroid disease, Parkinson's disease, diabetes, high blood pressure, and heart disease. You are encouraged to report negative side effects of prescription drugs. In the US, contact the FDA by visiting www.fda.gov/medwatch or call 1-800-FDA-1088. Sanofi is the holding company of a consolidated group of subsidiaries and operates in the United States as Sanofi US. For more information on Sanofi US, please visit http://www.sanofi.us and http://www.news.sanofi.us/social-media or call 1-800-981-2491.